Foodie Philip was in Burbank and had lunch with a friend at a Japanese restaurant, where the ‘Sushi and Sashimi’ lunch special was the choice. Lunch was $23.48 with tax and tip. Foodie Greg’s lunch cost $1.66. This is a great ‘recipe’ to use when you have lots of left-over vegetables from other dishes. The givens in this version are the yakisoba noodles and ground pork. We had carrot, snap peas and cabbage remaining, so that’s what went in. We used the flavor pouch from the noodles, but it was a serious disappointment. I think we should have put together an Asian style dressing of our own. The noodles are $3.19 for the pack, or $1.60 per serve. Dinner tonight needed a little more ‘zing’ to the sauce, as I’d hope for a little better for $7.19 a serve. Since Philip was on the way back from Studio City, a stop at Popeyes seemed like a good thing to do. Lunch today cost $5.69 per serve. The watermelon salad always leaves us with feta to be used, so Greg decided on a Feta and Spinach Frittata, which was really good. The feta, while creamy, isn’t as ‘cheesy’ as cheddars, so melds better with the other flavors. Dinner tonight cost $3.58 and was definitely above average. It’s the Sunday of a long weekend, so let’s indulge a little. Lunch today cost $3.98 a serve. 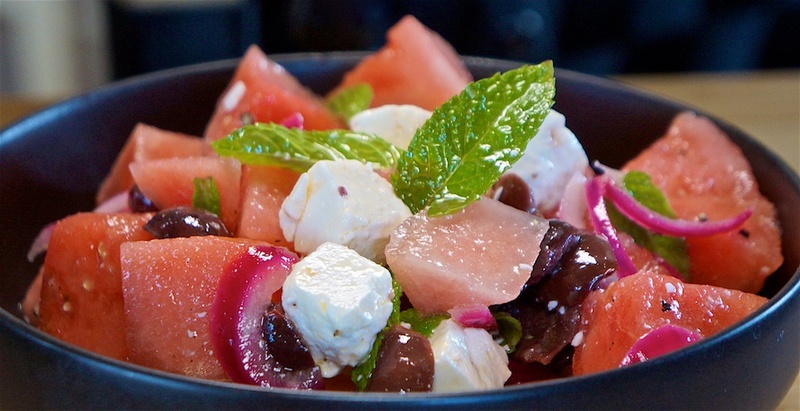 With the hot weather we’ve been having, it was a welcome return to a favorite: Nigel Lawson’s watermelon, feta and black olive salad. It’s a summer regular and very, very good. We made three serves from a small watermelon. Dinner tonight (with a lunch for Greg on Tuesday) cost $1.66 per serve. 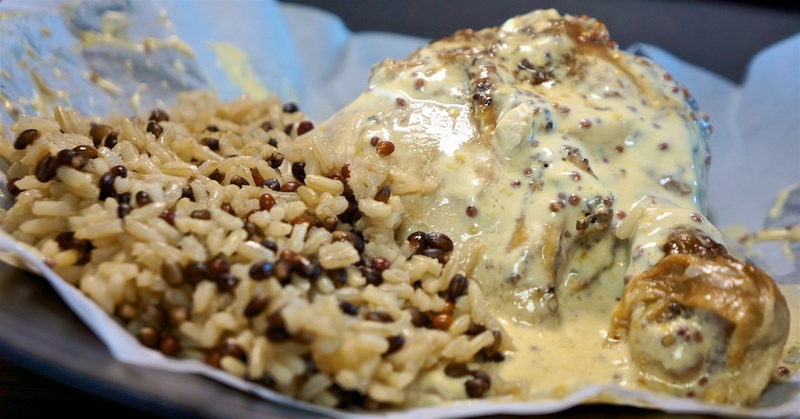 It’s an excellent dish and every time we serve it for someone, they want the recipe. It happens that The Country Deli is between Home Depot or Lowes and home. What else could we do but stop in for lunch. Foodie Philip continued with the marinated skirt steak, home fries and eggs, while Greg had a pastrami sandwich with steak fries. Lunch at The Country Deli (without drinks) always runs around $21.50 per serve with tax and tip. Cross rip steak still in the freezer from our meat delivery, so beef massaman curry even though the weather is anything but cold! We use a curry base we buy from Amazon for this simple, quick meal for three. Rice adds 30c per serve. Tonight’s dinner was $6.82 per serve and very tasty, as always. The beef softened to a beautiful texture with unctuous fat. For lunch we went back to our gyro/yeros meat in a wrap. The fully cooked sliced gyro/yeros meat is $3.99 per 10oz pack, or $1.00 per serve. 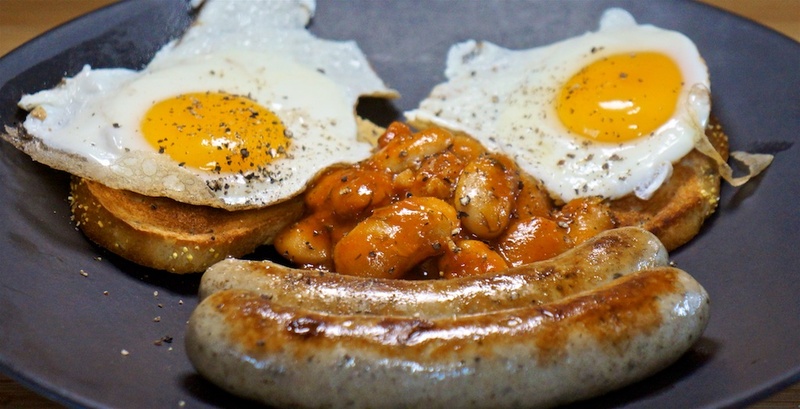 Our plan for massaman curry was postponed for a day, so we used what we had on hand, and created an “English” breakfast for dinner: bratwurst, baked beans, and pastured eggs on rye bread. Yum. Pastured Eggs are 50c each, so two adds $1.00 per serve. Dinner tonight was pretty tasty for $3.83 per serve. For variety we decided to go simple: tomato and melted cheese on an onion bagel. The sliced yoghurt cheese is $4.79 a pack of 12 slices, or 80c per serve. The best thing about the heritage pork we get from Prather Ranch is that they raise traditional breeds, breeds with fat in them that melts and lubricates the meat. They were seared on the griddle to perfection: a nice surface crust, and perfect medium rare inside. This is our third attempt at a bean mash. Yes, it’s another “pork and bean” night! Neither of the earlier versions were great. In fact, barely edible. This Serious Eats recipe is pretty good. 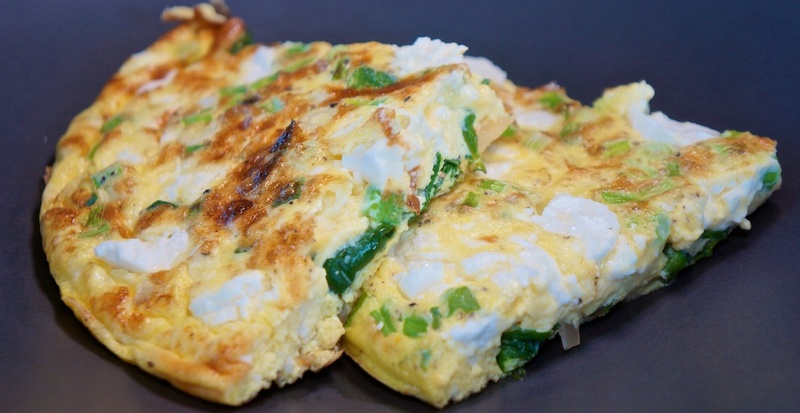 The combination of beans, greens and cheese is pretty tasty and the egg forms a rich sauce. The bean skins get in the way of perfect texture, so we think we might need to process them in the Cuisinart rather than just mash the beans. Tonight’s dinner was excellent: perfect pork chop, tasty mash and greens with an egg as the crowning glory, for $8.83 per serve. As it was LACPUG night, dinner was late at pizza after the meeting. Each person contributes $5.00 for pizza. 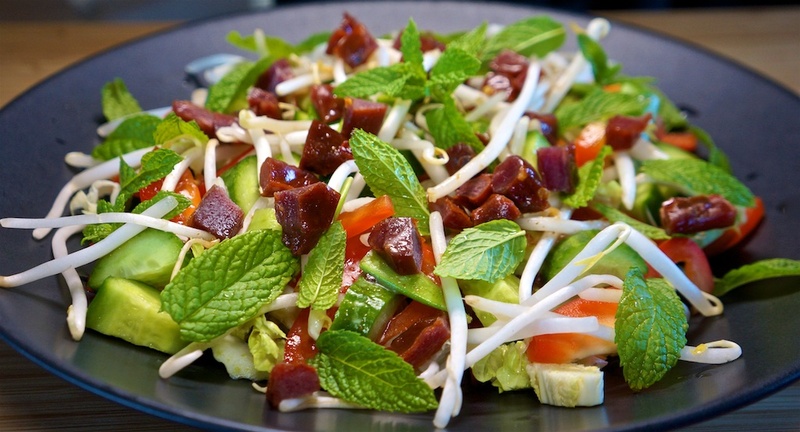 A return to a favorite: Crunchy Thai Salad. We simplified a little, leaving out the bock choy and cilantro and nuts. In the past we’ve topped the salad with seared tuna, or rare steak, but tonight we tried some thinly sliced beef jerky from our Prather Ranch source. Sliced thin across the grain so it wasn’t ‘chewy’ in the salad. 3 oz of spicy beef jerky is $6.40 or $3.20 per serve. Add 30c for the dressing ingredients. 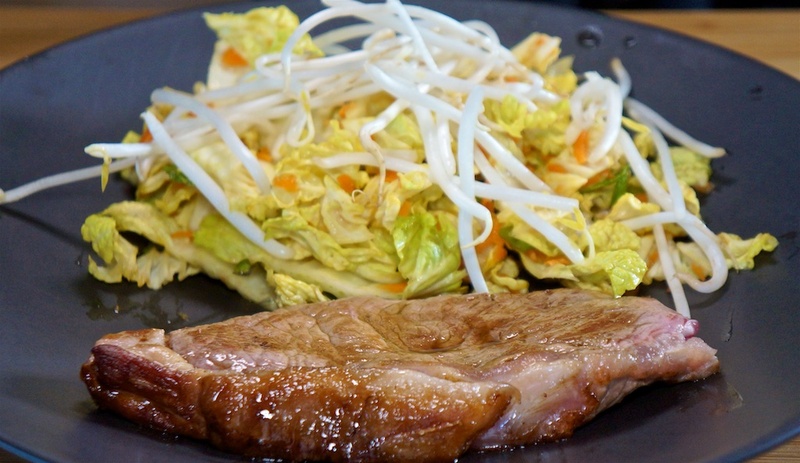 This is an amazing salad, and the beef jerk added an interesting texture and beef flavor to the dish. Dinner tonight cost $5.39. A change in Monday’s schedule had both foodies at home for lunch, so it was time to finish the Popeye’s chicken, and use up the last of the Vietnamese salad from last night. The salad is 96c per serve, but we shared one or 48c per meal. With asparagus and roast chicken legs in the refrigerator Greg decided to prepare En papillote: in paper. A cream sauce of mustard, labné, and white wine based on Serious Eats Mustardy Salmon provides a moist environment for the asparagus to cook and the chicken to reheat. Wild rice blend ads 35c per serve. Another advantage of cooking in a paper parcel: no washing up! Dinner tonight was quick and easy and cost $4.57 per serve. For some variety on our chicken wrap, we swapped to an onion bagel sandwich with tomato. Add 10c for vegan mayo. Lunch today cost $1.52 per serve and a nice variation. This month’s Prather Ranch meat delivery included three 6oz NY Strip steaks, and since we had a guest for dinner, we kept all three whole and cooked them on the griddle. We served with Nigella Lawson’s Vietnamese Chicken Salad without the chicken! The limes for the dressing were 19c each (bargain) and we used four, but only about half the juice was used, leaving the rest for a later Gin and Tonic – 13c per serve. Dinner tonight cost $10.49 per serve and was very good.